German Orientalist; born March 2, 1836, at Harburg. He studied Oriental languages at Göttingen, Vienna, Leyden, and Berlin; became assistant professor of Semitic languages at Göttingen in 1864; was appointed to a professorship at Kiel in 1868, and at Strasburg University on its foundation in 1872. The last-named chair he has filled ever since. 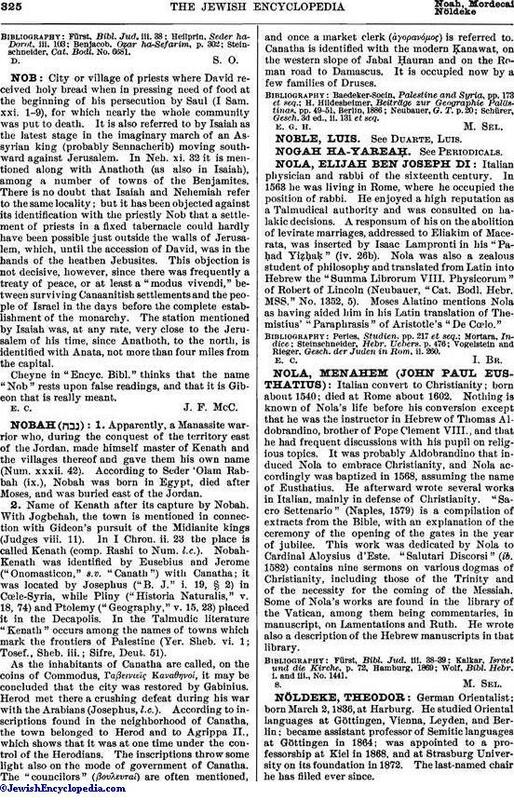 Nöldeke's researches are spread over a large section of Oriental philology, especially Persian, Arabic, and Syriac; and he has, besides, devoted himself to several branches of Old Testament research. Among his many works those of chief interest to Jewish readers are: "Ueber die Amalekiter," Göttingen, 1864; "Die Alttestamentliche Litteratur," Leipsic, 1868; and his classic "Untersuchungen zur Kritik des Alten Testaments," Kiel, 1869. His three grammars, New Syriac (Leipsic, 1869), Mandæan (Halle, 1874), and Syriac (Leipsic, 1880), have contributed greatly to Semitic comparative philology; and his small volume, entitled "Die Semitischen Sprachen" (ib. 1887; 2d ed. 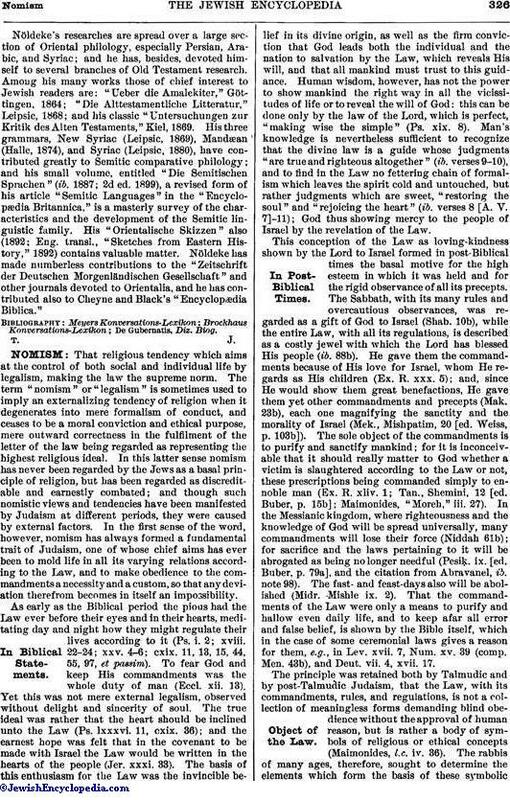 1899), a revised form of his article "Semitic Languages" in the "Encyclopædia Britannica," is a masterly survey of the characteristics and the development of the Semitic linguistic family. His "Orientalische Skizzen" also (1892; Eng. transl., "Sketches from Eastern History," 1892) contains valuable matter. Nöldeke has made numberless contributions to the "Zeitschrift der Deutschen Morgenländischen Gesellschaft" and other journals devoted to Orientalia, and he has contributed also to Cheyne and Black's "Encyclopædia Biblica."